Dental crowns are often being referred to as “caps”. They are custom-engineered caps made from the most durable materials which completely covers the severely damaged or weakened tooth structure. Although dental crowns are usually more expensive than filling, they often outlast any direct dental fillings. A crown can be made from different materials, including metal, porcelain, or a combination of both. Lara Village Dental provides different types of dental crowns to suit your particular aesthetic and functional need. A tooth could often become weakened or compromised structurally after having one or multiple large fillings placed, this situation most commonly occurs to teeth after root canal therapy. After years of chewing and grinding during function, heavily filled or structurally compromised teeth could develop multiple deep cracks and fracture catastrophically. Root canal treated teeth are even more vulnerable as the central part of the infected teeth need to be dis-infected and cleaned out in order to eradicate any residual bacteria, researches have suggested that root canal treated teeth are more fragile under the chewing force and fractures are usually the top reasons of failure in such teeth. Dental crowns not only protect your teeth in these situations, but also significantly improve the longevity and success rate of heavily filled or root canal treated teeth. When a crown is carefully and meticulously fabricated, it also closely mimics the anatomical form and natural colour of a tooth, to give you the best cosmetic outcome. A dental bridge provides a cost effective fixed solution for replacing single or multiple missing teeth. Most commonly, the two teeth either side of the missing tooth (teeth) are crowned and acting as supporting structure or “pillar”. The whole unit of dental bridge is fixed and bonded on to your natural teeth. It is not removable. 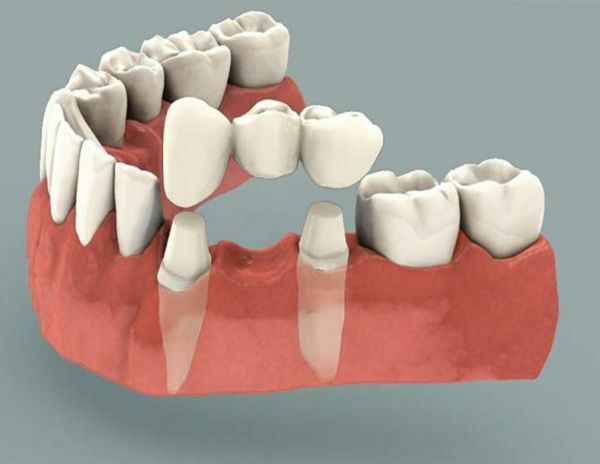 A dental bridge could be the best solution for replacement of 1-2 missing teeth, as an alternative to dental implants. It could reinforce the structure of the neighbouring teeth (also known as abutment or anchorage teeth), as well as replacing the missing tooth or teeth at the same time. It provides a fixed solution and does not need to be taken out or removed for cleaning,and it is made to match the shape and shade of your remaining teeth for best possible aesthetic outcomes. Dental veneers could be considered as a “partial cap” on the superficial surface of your front teeth. This treatment is suitable for those who want to improve the appearance of their smiles, whether it’s the colour, shape or alignment of your teeth that you are not happy about, it can be improved. Dental veneers are predominantly retained by a chemical bond between porcelain material and the facing of your teeth. This treatment is minimally invasive and gives extra protection and strength to your natural teeth. In order to benefit all patients living in Lara, Corio, Norlane and Greater Geelong area, we are offering very affordable solution for crown and bridge treatment. We also have payment plan options available so that you could smile now and pay later. Call us now for a FREE consultation to find out more.